best served warm, with Greek salad and French bread. eggplant, then cut the eggplant lengthwise into 1/2-inch slices. salt and let them sit for 30 minutes. Rinse well, drain, and pat dry. soft. Remove and set aside to cool. to absorb some of the natural liquids. translucent, add the meat and continue to sauté until lightly browned. aside, covered, until ready to use. temperature. 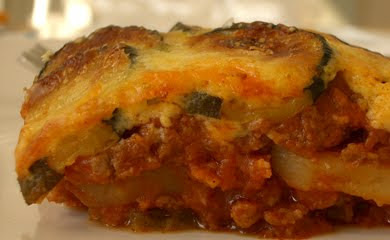 Moussaka is even better the next day. fruit is a light way to end on a sweet note. frozen. Defrost and and reheat in a 350° (175-180°C) oven. Video shows dried seeds and garlic bulbs. While the bulbs are used for eating and food preparation, they can be used for planting next year. The seeds are for planting. диви здравец се користи за стомачни проблеми и дијареа. Тоа е подготвено во чај. The wild geranium is used as a tea for stomach problems and diarrhea. peoples to stop bleeding and to treat diarrhea. constipation in the elderly and the anemic. flies will lay eggs in the mulberry fruit. Andrew Weil says to avoid eating farmed fish. He writes in The Healthy Kitchen specifically about salmon. "Farmed salmon has less flavor, less protein, and more fat than wild salmon, and its content of omega-3 fatty acids may not be as high." Farmed salmon may also have residues of antibiotics and other drugs to control diseases that occur when fish are crowded into to fish pens. It also takes several pounds of feed fish to produce one pound of salmon. Eating farmed fish doesn't really save the fish population. Weil's recommendation is to choose wild Alaska salmon. 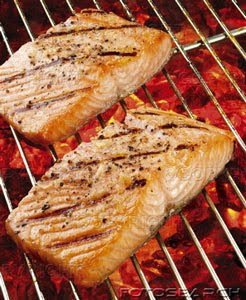 Here is a recipe for BBQ salmon from cooks.com. Tear off sheets of heavy duty foil large enough to hold all steaks. Fold sides up to form pan. Grease lightly. Sprinkle steaks with lemon pepper and salt. Place steaks in foil pan and set aside. Combine salad dressing and onion; set aside. Preheat grill on medium for 10 minutes; turn to low. Brush steaks on both sides with salad dressing mixture; place steaks back in boil pan and place on grill. Close lid and grill 12 minutes. Six on a side or until steaks flake; baste often. Sprinkle with parsley and serve.